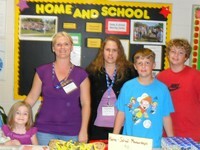 Home and School - the best choice for parent involvement. Home and School Associations serve as one important way for parents and community to be involved and engaged in the success of children. Involvement not only includes participating in school fundraisers or attending performances and athletic events, but also means partnering with the school to support learning at home. We recognize that it takes a village to raise a child – parents; step-parents; parents’ significant others; foster parents and adoptive parents; siblings; grandmother, grandfather; aunts, uncles, elders and other extended family; friends and neighbours; and members of the community – often contribute in significant ways to a child and youth’s success and well-being. We hope that this list may spark an idea OR validates the work already undertaken by your Association. Best practice outline key elements of effective ways Home and School Associations can further their role of involving and engaging families. The following list describe ideals, serves as guidelines and are not exhaustive. Resource/information kits for parents new to the school or new high school parents. Kits might include school, school board, and Home and School documents, contact information and a “who does what” brochure for the school and the school board, or tips for homework support. the role of a trustee, superintendent, director, principal, teacher. Explore translation services for these evenings as well, and provide trained child care, and food. Host “Family Dinner” evenings to promote good nutrition, food preparation, and the importance of finding time to work together as a family. Open these sessions to your entire parent community. Develop resources/programs to reach stay-at-home and working parents, moms and dads, new Canadians, and ESL adults. Provide free book bags full of children’s books for parents. Offer tips for family reading time. evening out together. Plus, a Family Movie Night is easy to organize and run. Your movie night will allow parents and their children to experience the school in a whole new way. And it will give you a forum to showcase your Home and School Association to prospective members. Once parents see your group in action, they’ll want to be part of it! Set up a Buddy System for new and ESL families to help them become familiar with the school’s culture and operation. shows/multicultural nights to explore different traditions and cultures. Breakfast/Snack Programs focusing on good nutrition. Provide nutrition counseling and food preparation practice for children. Invite parents in the evening and have the children prepare food for them. TVCHSA - strives to highlight resources that support the objectives and mission of OFHSA.